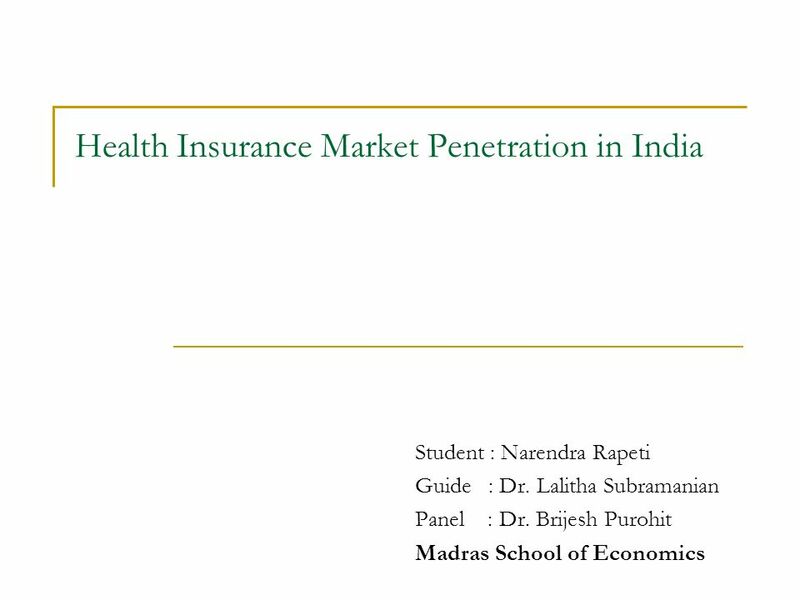 Health Insurance Market Penetration in India Student : Narendra Rapeti Guide : Dr. Lalitha Subramanian Panel : Dr. Brijesh Purohit Madras School of Economics. 2 Dissertation Why am I doing this study? 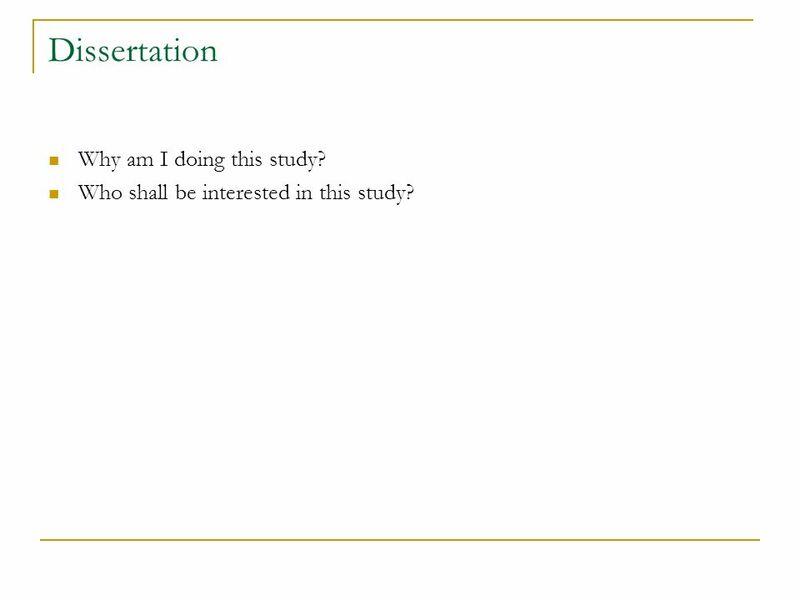 Who shall be interested in this study? 13 Key Observations 1. 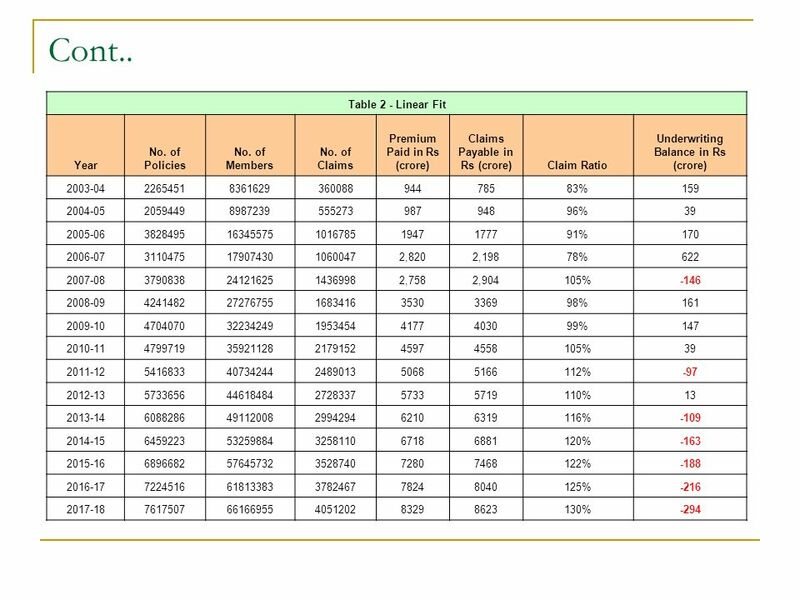 Table 1 encloses the data related to Paid Claims and not the Incurred Claims. Why are the Incurred claims data which is crucial and important not reported? 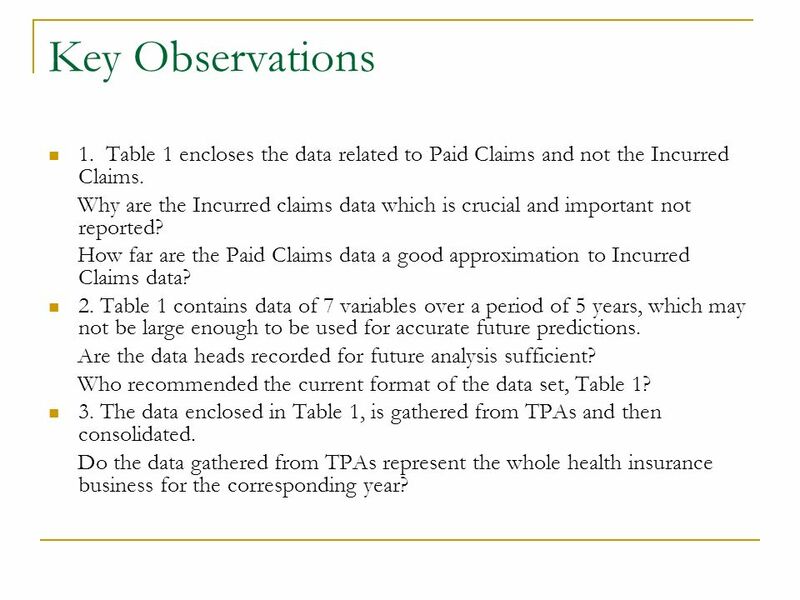 How far are the Paid Claims data a good approximation to Incurred Claims data? 2. Table 1 contains data of 7 variables over a period of 5 years, which may not be large enough to be used for accurate future predictions. Are the data heads recorded for future analysis sufficient? 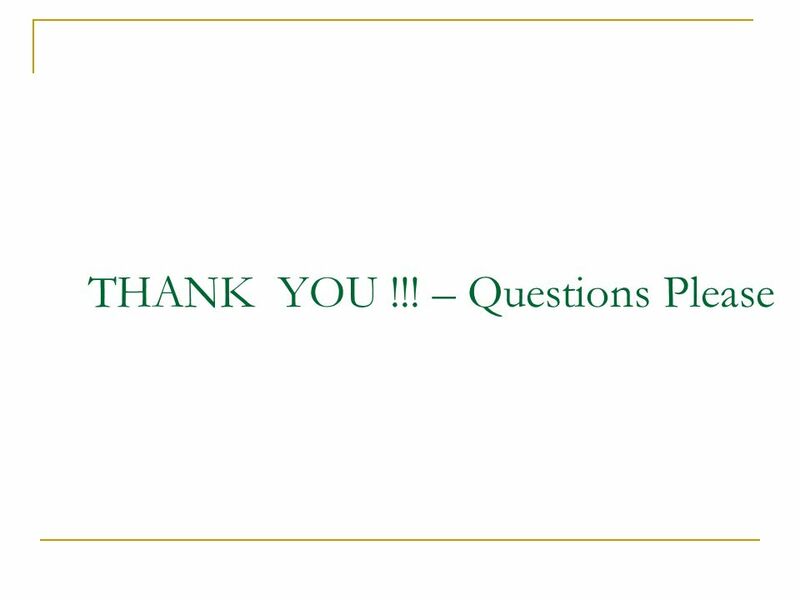 Who recommended the current format of the data set, Table 1? 3. 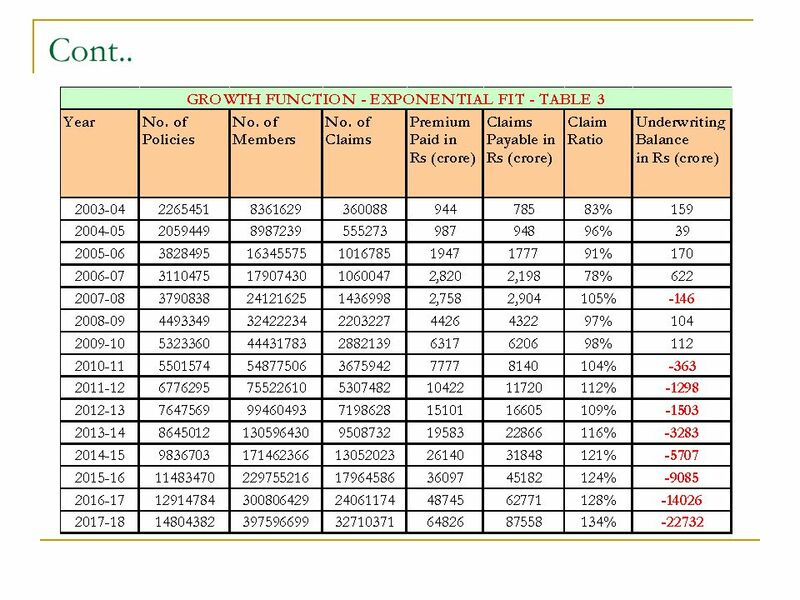 The data enclosed in Table 1, is gathered from TPAs and then consolidated. 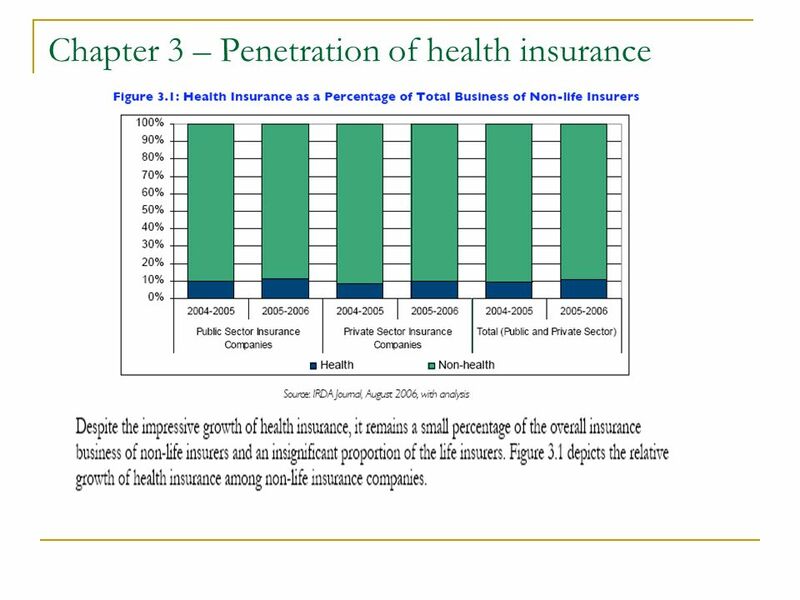 Do the data gathered from TPAs represent the whole health insurance business for the corresponding year? 14 Key Assumptions 1. 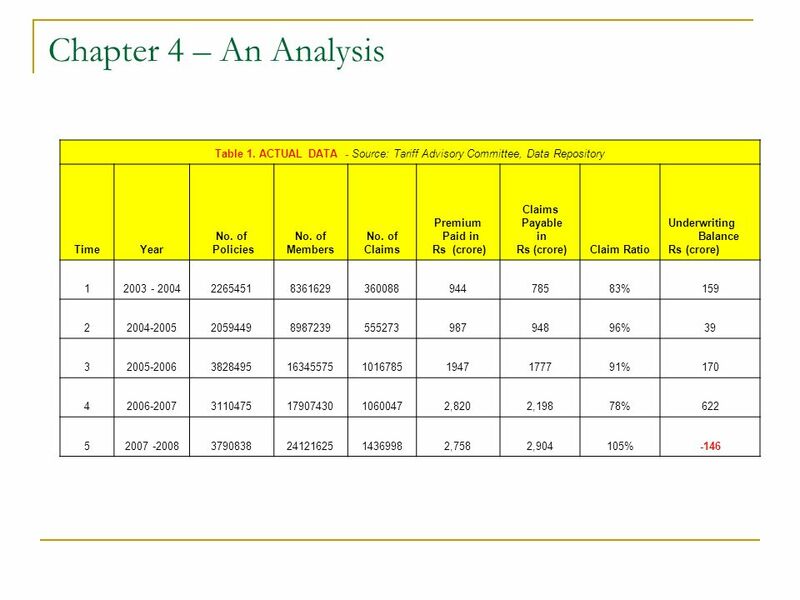 Assuming that the Paid Claims data represents Incurred Claims. 2. Linear fit is a good approximation for projecting the future values. 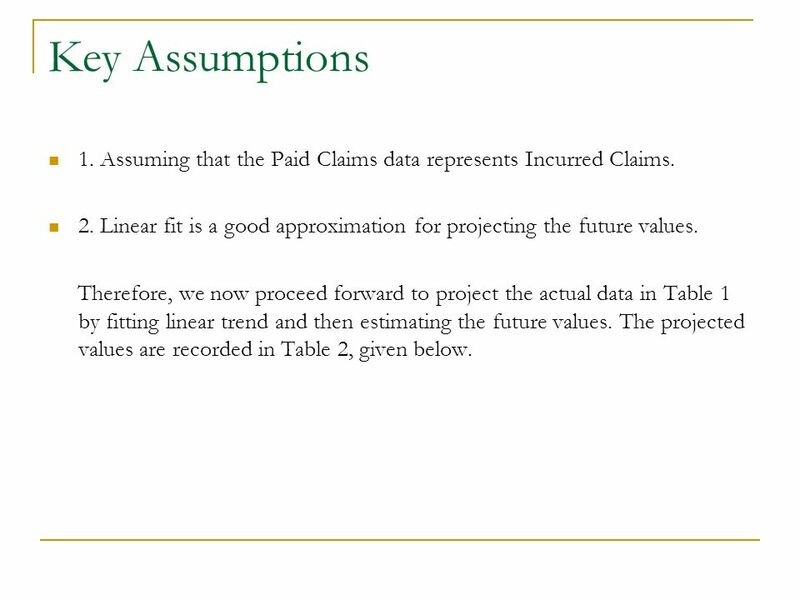 Therefore, we now proceed forward to project the actual data in Table 1 by fitting linear trend and then estimating the future values. The projected values are recorded in Table 2, given below. 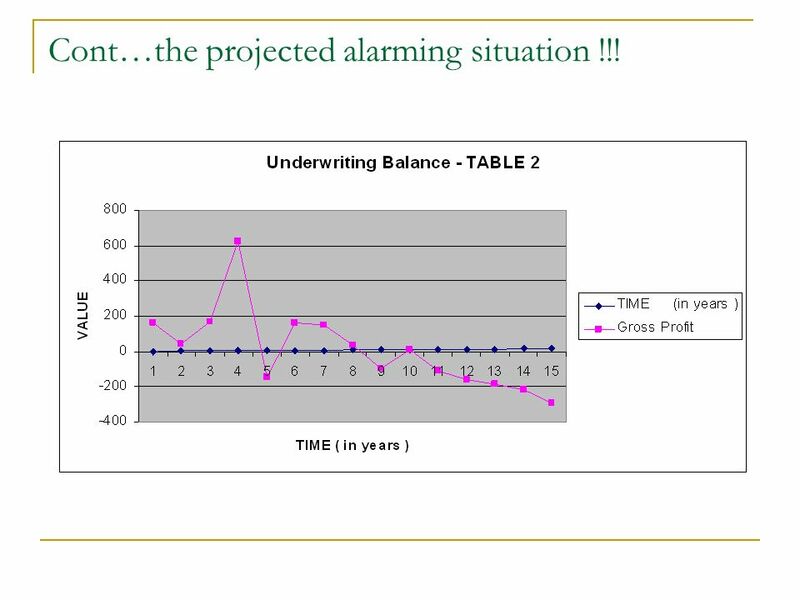 17 Cont…the projected alarming situation !!! 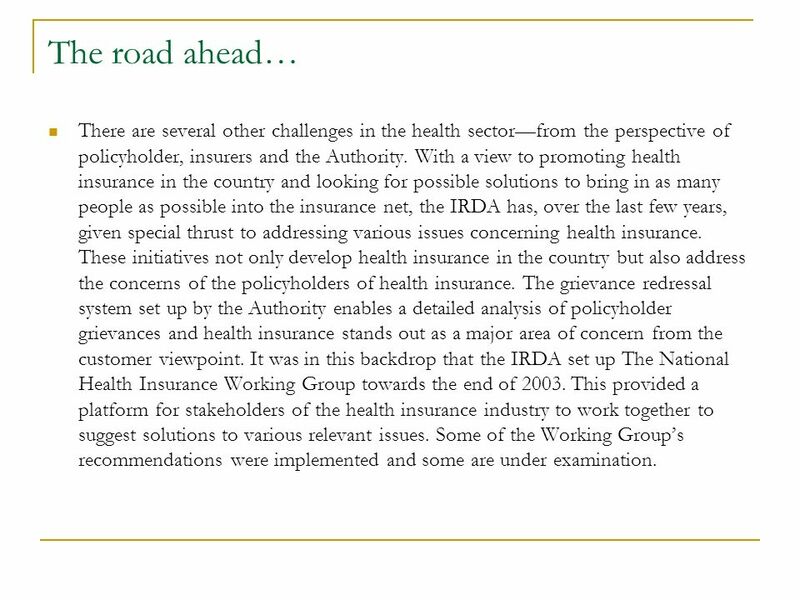 20 The road ahead… There are several other challenges in the health sectorfrom the perspective of policyholder, insurers and the Authority. 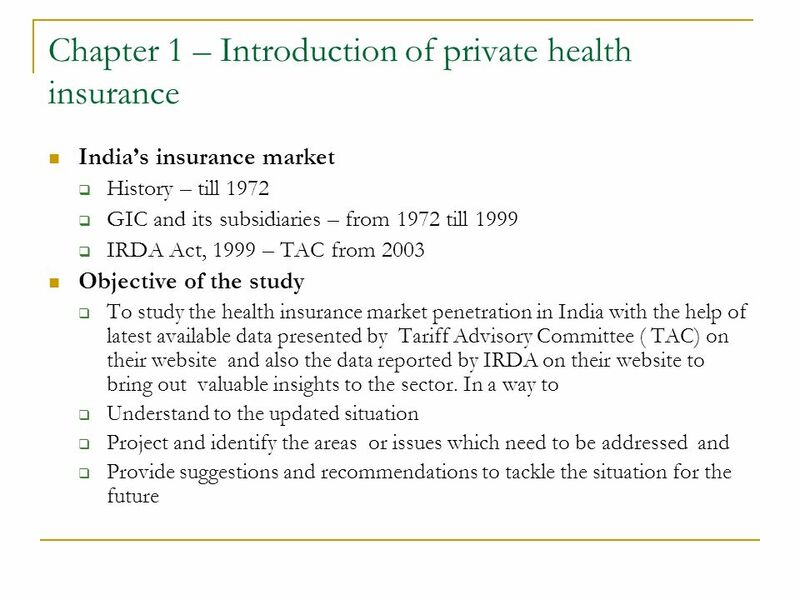 With a view to promoting health insurance in the country and looking for possible solutions to bring in as many people as possible into the insurance net, the IRDA has, over the last few years, given special thrust to addressing various issues concerning health insurance. These initiatives not only develop health insurance in the country but also address the concerns of the policyholders of health insurance. The grievance redressal system set up by the Authority enables a detailed analysis of policyholder grievances and health insurance stands out as a major area of concern from the customer viewpoint. 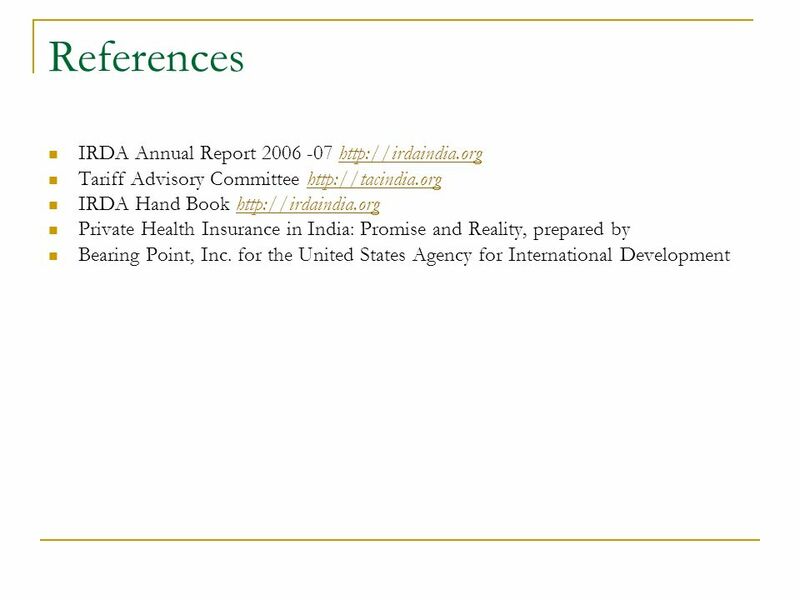 It was in this backdrop that the IRDA set up The National Health Insurance Working Group towards the end of 2003. 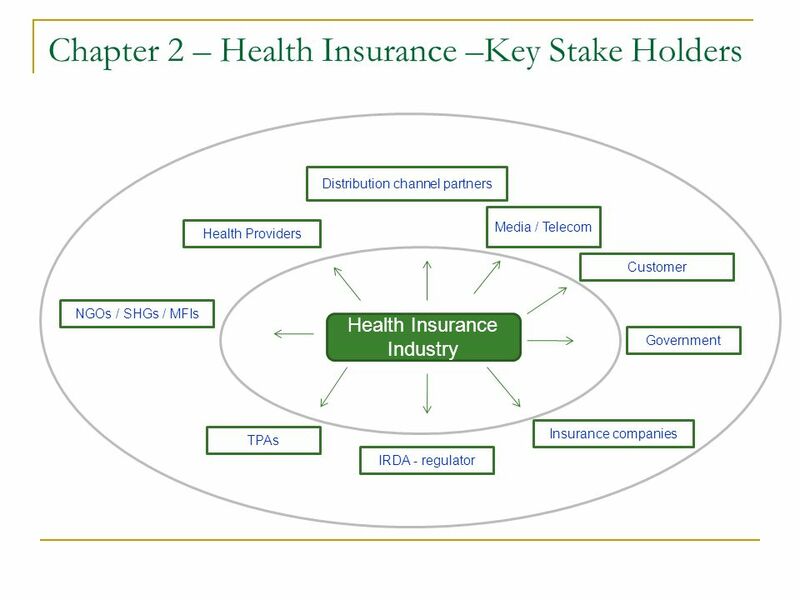 This provided a platform for stakeholders of the health insurance industry to work together to suggest solutions to various relevant issues. Some of the Working Groups recommendations were implemented and some are under examination. 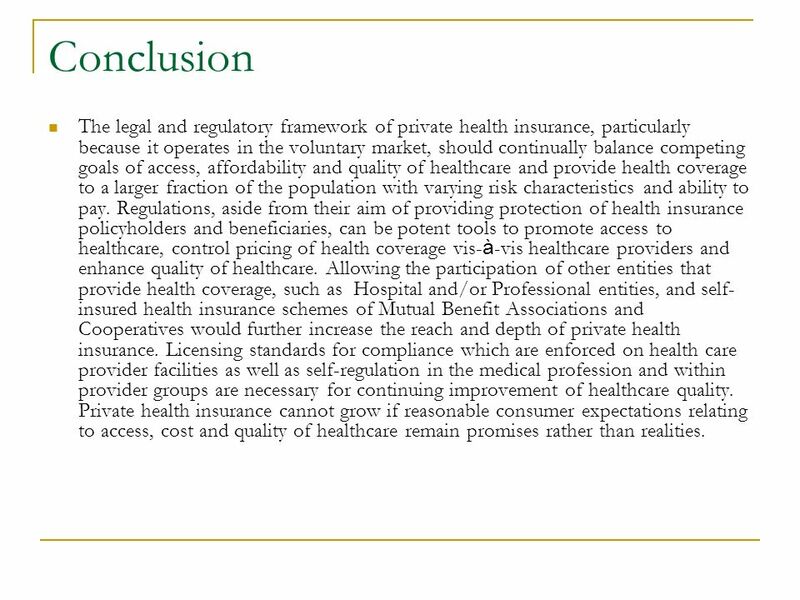 21 Conclusion The legal and regulatory framework of private health insurance, particularly because it operates in the voluntary market, should continually balance competing goals of access, affordability and quality of healthcare and provide health coverage to a larger fraction of the population with varying risk characteristics and ability to pay. 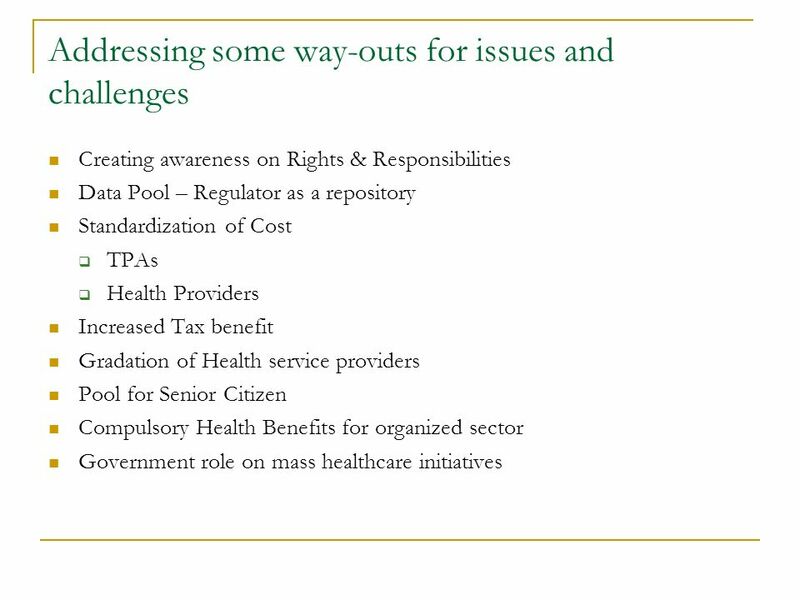 Regulations, aside from their aim of providing protection of health insurance policyholders and beneficiaries, can be potent tools to promote access to healthcare, control pricing of health coverage vis- à -vis healthcare providers and enhance quality of healthcare. 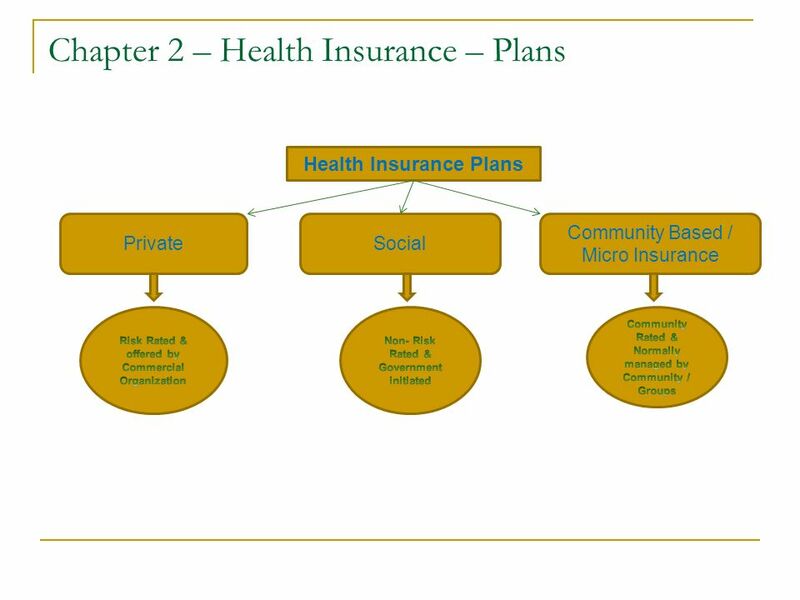 Allowing the participation of other entities that provide health coverage, such as Hospital and/or Professional entities, and self- insured health insurance schemes of Mutual Benefit Associations and Cooperatives would further increase the reach and depth of private health insurance. Licensing standards for compliance which are enforced on health care provider facilities as well as self-regulation in the medical profession and within provider groups are necessary for continuing improvement of healthcare quality. 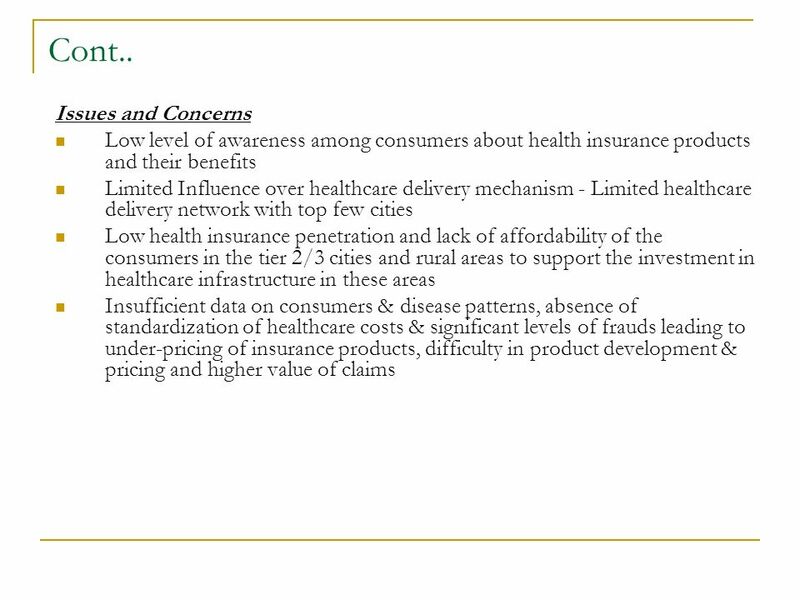 Private health insurance cannot grow if reasonable consumer expectations relating to access, cost and quality of healthcare remain promises rather than realities. 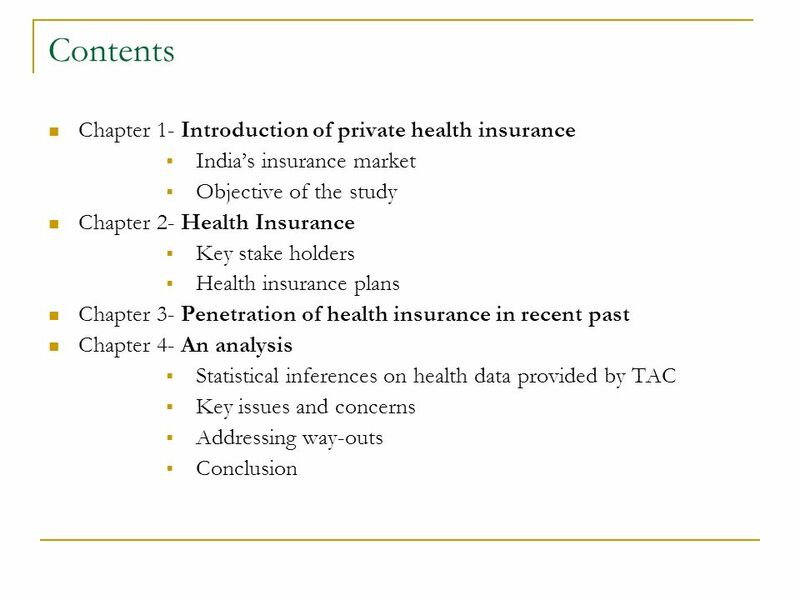 Download ppt "Health Insurance Market Penetration in India Student : Narendra Rapeti Guide : Dr. Lalitha Subramanian Panel : Dr. Brijesh Purohit Madras School of Economics." Active ageing into practice! Experiences of civic engagement in health policies Alessio Terzi, Teresa Petrangolini, Giulia Savarese Cittadinanzattiva. Ageing in OECD countries and the need for private pensions Stéphanie Payet and Clara Severinson The Working Party on Private Pensions 24 October 2011. The NBS Insurance supervision Radovan Jelasic Belgrade, June 24, 2004. Amanullah Saif Cost Accountant, Drug Control Administration Government of Pakistan Relationship between Tariffs, Prices and Consumption of Interferon. 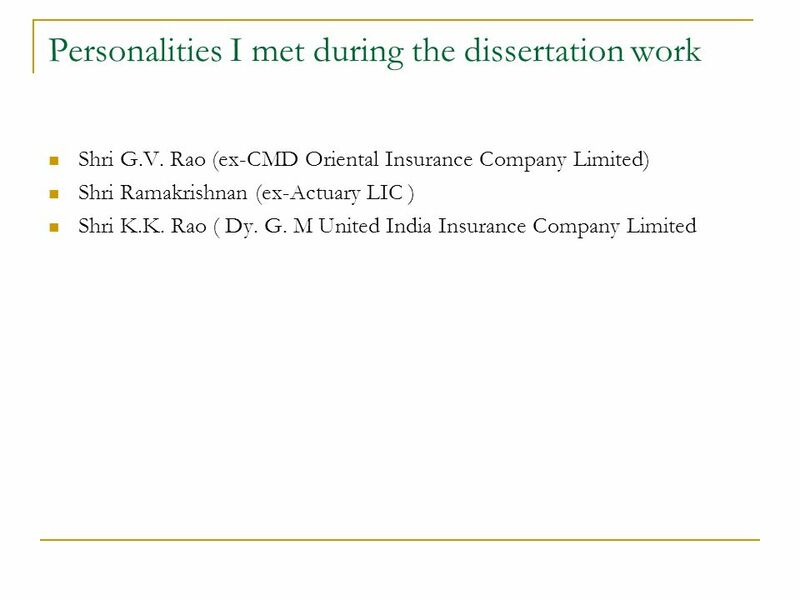 Prospects and Problems Healthcare Provider Dr. P. Prabhakar Chief Operating Officer Kamineni Hospitals. Supporting National e-Health Roadmaps WHO-ITU-WB joint effort WSIS C7 e-Health Facilitation Meeting 13 th May 2010 Hani Eskandar ICT Applications, ITU. Performance of Australian Superannuation Funds: Efficiency, Governance and Reporting Practices Yen Bui & Sarath Delpachitra 2. Data & Statistics and Consumer Related Issues. Importance of Data Data and Information are the vital inputs in framing of fiscal, monetary, regulatory. STRENGTHS AND WEAKNESSES IN DANISH POLICIES: LESSONS FROM OECD’S MENTAL HEALTH AND WORK REVIEW Christopher PRINZ Employment Policy Division Directorate. Seminar and Workshop on the ASEAN Community Statistical System on 17 th June 2014 Progress of ASEAN-Japan Transport Statistics Database under ASEAN-Japan. 1 blueshieldca.com Getting There Together: Creating Sustainable Value Through New Partnerships Kristen Miranda Vice President, Strategic Partnerships and. 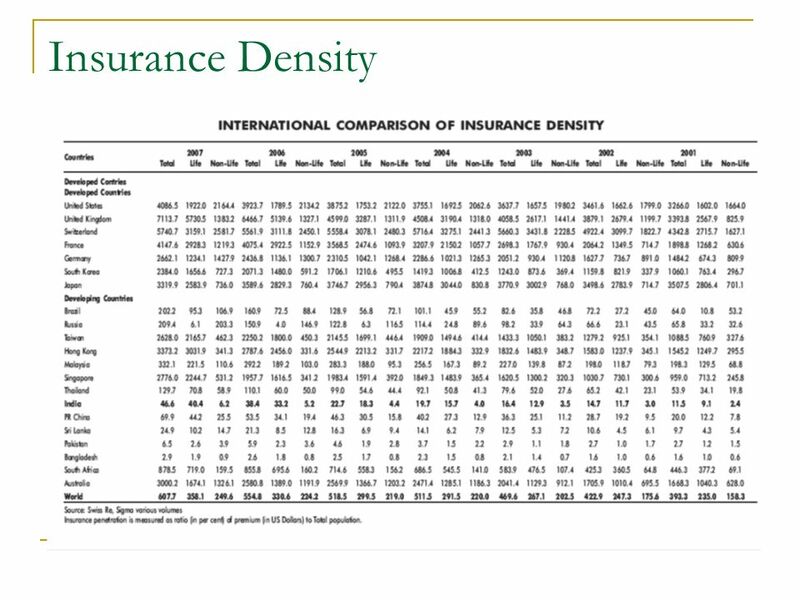 Pricing Micro Insurance Products: Experience from the Field Atish Govil October 14, 2005. 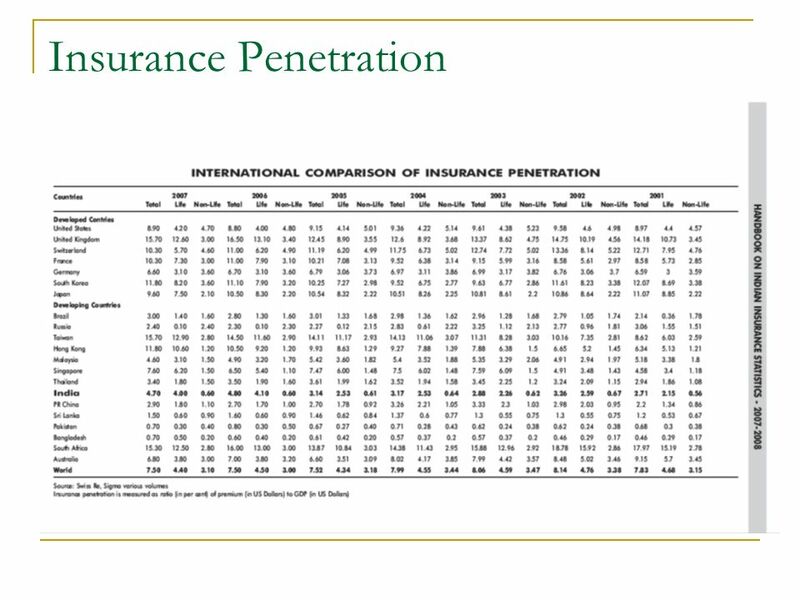 1 THE COMPLEXITY OF INSURANCE PRODUCTS AND THE DEVELOPEMENT OF FINANCIAL EDUCATION BY THE INSURANCE REGULATOR FINANCIAL EDUCATION BY THE INSURANCE REGULATOR. 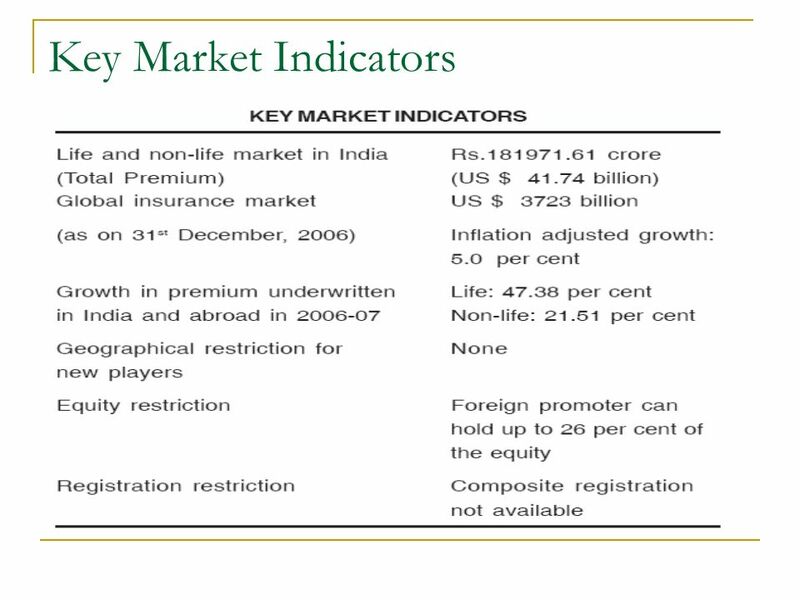 LIFE INSURANCE INDUSTRY IN INDIA - AN OVERVIEW T.S.VIJAYAN Chairman, LIC of India President, Insurance Institute of India.